Denny Rickards has had an opportunity to fish and guide anglers over some of the most challenging trophy trout waters in the Western United States over the past 30 years. His simplistic approach and techniques on presentation have accounted for cutthroats to 15 pounds, rainbows in excess of 16 pounds and browns over 20 pounds. 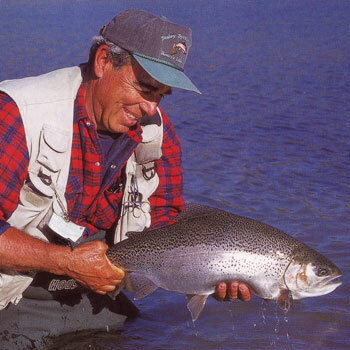 Denny has been fishing, guiding and studying trout behavior for the past 30 years. He's an expert on fish lakes and has developed a selection of suggestive flies that put the trophy trout on the take. Join us to hear about Denny's latest new techniques on fishing lakes. Denny Rickards is one of the great masters of stillwater fly fishing. In this show Denny covers trout behavior, the impact of weather conditions on trout & their food sources, using the correct line, pattern & retrieve that matches the zone you are fishing, positioning to make the right cast & much more. Denny spends over 250 days a year doing what he loves best: guiding, writing, typing flies, conducting fly fishing schools and field testing and developing fly fishing manufacturer's products. Denny guides full time on Upper Klamath Lake. When Denny isn't fishing or guiding, he spends many hours studying trout behavior, their habitat, and the various insects found within their environment. As a professional fly tyer Denny's suggestive patterns have appeared in various outdoor magazines and are on display at Cushners Fly Fishing Museum in Florence, Oregon. Based on past reveiws, his books and companion videos are now considered the "bibles" for fly fishing lakes. Denny Rickard's knowledge and ablility to teach others were a prerequisite to establishing his fly fishing schools/clinics which have become a priority for anglers seeking the ultimate form their stillwater angling experiences. For more information on Denny's flies, materials, books, videos, gear and guided trips visit his web site at www.flyfishingstillwaters.com.